A veterinary surgeon is a veterinarian with advanced training and expertise in the diagnosis and treatment of all aspects of surgical diseases in your pet. All surgeons are trained in soft tissue (abdominal, thoracic, reconstructive, oncologic), neurological and orthopedic surgery. Some surgeons have a particular interest or focus in one of these areas of surgery, such as orthopedics or minimally invasive procedures. 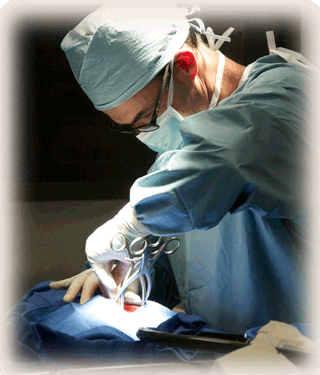 Board certified surgeons are skilled in anesthesia and pain management as well. In addition to providing surgical care to their patients, CVRC's surgery department works collaboratively to support the other services at CVRC, as well as with your family veterinarian. We are excited to offer a full physical rehabilitation facility onsite at CVRC to help obtain the best possible outcomes and return to function. Three years of advanced surgical training (residency). A series of rigorous examinations covering all aspects of general medicine and surgery. When your pet needs the care of a veterinary surgeon, years of intensive training and education will be focused on helping your pet to enjoy the best quality of life possible or return to function after injury. With appropriate expertise, diagnostics tools, care, and follow-up, we are excited to offer the very best surgical treatment options for your pets. How much does it cost for a consultation with the surgeon? Depending on the nature of your pet's disease or injury, the diagnostics or treatments performed, and their timing, your pet may or may not need to stay overnight. Our doctor or veterinary nurse will discuss the expected hospital stay during your visit or admission to the hospital. Many surgical procedures will necessitate an overnight stay for monitoring of vital parameters, medication delivery, and ensuring patient comfort. Many surgical patients are discharged with medications to continue at home. These medications help with patient comfort (pain medications, anti-inflammatory medications), but sometimes antibiotics or other medications are necessary.